Over 550 spells of dire consequences, secrets, and unfathomable power! Here are gathered spells drawn from over thirty years of Call of Cthulhu supplements and scenarios. Each spell has been revised for the Call of Cthulhu 7th edition game, including optional Deeper Magic for the most powerful of Mythos sorcerers and monsters, with which to beguile and confound investigators. Packed full of advice and guidance on diverse matters including spell names, elements of spell casting, magical components, and astronomical considerations. Plus flawed spells, ley lines, folk magic, and the magic of the Dreamlands. Use this grimoire as a resource, a play aid, and as inspiration when designing scenarios. 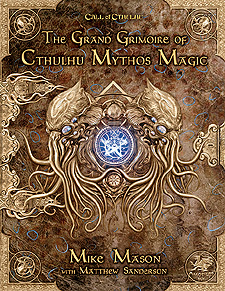 The Grand Grimoire of Cthulhu Mythos Magic is an essential supplement for Keepers of Arcane Lore.